HCM City (VNA) – Winners of a contest on ASEAN’s 50-year development toward the ASEAN Vision 2025 were honoured during a ceremony in Ho Chi Minh City on August 25. More than one month since it was launched, the contest drew the participation of nearly 80,300 people from 41 cities and provinces across Vietnam as well as some ASEAN countries. 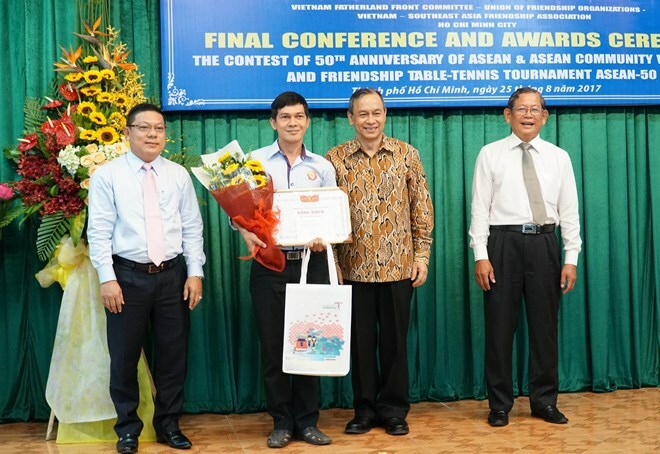 Nguyen Van Quy from District 6 of Ho Chi Minh City won the first prize. The organising boardalso awarded three second, four third and 22 consolidation prizes, and 10 certificates for outstanding collectives. The contest focused on studying the culture, history, tradition and people of ASEAN countries, as well as the diplomatic relations between Vietnam and other ASEAN member nations. Tran Tan Ngoi, Vice President of the Vietnam Fatherland Front Committee in Ho Chi Minh City said that the contest attracted people of all strata in Vietnam and many citizens of ASEAN countries living in Vietnam, helping them better understand the significance of building the ASEAN Community with a vision towards 2025, as well as raise their responsibility as citizens of ASEAN.